Welcome to Les Chataigniers! Set around the courtyard of a former farm, our spacious stone farmhouse with separate games room and swimming pool overlook nine acres of garden, fields and woodland. Visitors remark on the beauty and tranquility of its setting, tucked away at the end of a country lane in a tiny hamlet on the Tarn/Aveyron border. The seven-bedroomed farmhouse is designed for groups to share comfortably - all four of the upstairs double bedrooms have full en-suite shower room with w.c. and sink, and there is also a single/cot room on this floor. The two downstairs double bedrooms share a large family bathroom with bath, separate shower, sink and w.c. Four of our bedrooms can be configured as either doubles or twins, two can comfortably accommodate a third single bed. The accommodation is therefore highly flexible. If you are a group of friends or extended family looking for a place to enjoy each others company but escape to your own space when you need to - you will find it at Les Chataigniers. Outdoors, the central courtyard area is ideal for a game of boules, and a large dining deck with gas barbecue (gas bottles provided) faces south-west to take full advantage of the evening sun. Across the courtyard is our enormous, well-equipped games room where you will find table tennis and snooker tables, a bar area, sofas and armchairs, an overhead projector and screen, bookcases full of holiday reading, and a well-stocked childrens' toy corner - a great place to encourage the younger members of your party to take a break from the midday heat, as well as a great socialising space for the evenings. Double doors lead out from the games room to the fully-fenced pool deck, which has spectacular views over the valley. The 8m x 5m pool with its decked surround and sun loungers is heated by solar panels and is usually open from late May until at least the end of September. Groups with small children will be pleased to know that all access points into the pool area are padlocked and that an additional pool alarm can be activated if required. Below the pool is a level, grassed games area perfect for croquet or other ball games, with swings, climbing frame, slide and wooden playhouse. Below the buildings of Les Chataigners is the meadow; play a game of rounders here, pick wild flowers and hunt for butterflies, or adventure across it to the woods above the stream. Produce from our organic vegetable garden is available in season for guests' use - and we also keep chickens, and encourage young visitors to collect their own breakfast eggs! Exploring the glorious countryside around, on foot or by bike, is a delight. A short drive or woodland walk brings you to our nearest village with its bakery, butcher and general store. Further afield are historic bastide towns, vineyards, castles, lively markets and wonderful outdoor leisure opportunities. Do take a look at our aerial video further down this listing in order to fully appreciate the setting and layout of our property (please note that the cottage shown in the video is never rented out at the same time as the farmhouse - this is where we spend some of the summer, and where we will be available to help you with any queries). We are Mark and Christine, former teachers originally from Yorkshire, via Surrey! We bought Les Chataigniers because we had ourselves spent four years of fantastic holidays here with our family and friends when it was under previous ownership. The buildings and the setting were always magical, but through investing time and love in the property, we like to think we have made it into something quite unique. Bathrobes plus bath sheets, hand towels and bath mats are supplied; a mid-point change of towels is included for bookings of two weeks. Swimming pool towels are supplied - please do not use towels from bedrooms at the pool. Egyptian cotton sheets (one fitted, one flat) plus a duvet and a bedspread - to use separately or together according to temperatures. In separate laundry room, shared with owner. Ample courtyard parking for up to 6 cars. Secure undercover parking available if required for classic cars, motorbikes etc. Waffle cotton bath robe for adults; large bath sheet plus hand towel per person in bedrooms; bath mats; swimming pool towels, tea towels. Inset wood burner, logs provided. Large, extra-wide fridge with water dispenser. Range-style cooker with two ovens (one convection, one normal) and separate grill. Five burners (one extra-large) plus hotplate area. Filter coffee machine. Two large insulated stainless steel cafetieres also provided. Salt, pepper, mixed herbs plus starter supplies of tea, coffee, sugar, oil and vinegar. Large, sociable dining kitchen with extendable table seating 12 adults in comfort, 14 at a squeeze! Large extending kitchen table comfortably seats 12, 14 at a squeeze! Double doors open to dining deck with two large tables and parasols, plus gas barbecue. A huge space with table tennis and snooker, home cinema, adult and children's books and games. Guests are free to use any part of our extensive grounds, comprising areas of meadow, woodland, lawns and formal gardens. Free of charge, use at your own risk. Child's seat available. The deck is large and wraps around two sides of the property, offering shade or sunshine as required. Guests renting the Farmhouse have exclusive use of the pool. Our bedrooms are almost all en suite, and all bathrooms apart from one have been refitted over the past two years. The beamed sitting room, dining room and kitchen with dining deck adjoin each other giving an easy flow of activities. The kitchen has a range style cooker, dishwasher and extra wide fridge/freezer, plus plenty of work surface and storage space. Excellent range of pans, casseroles, serving dishes etc. more than adequate for 12. The dining area has table and chairs for 12. Extra seating is of course available for larger parties, as are high chairs for groups with babies and toddlers. Double doors open from the kitchen onto the deck with tables and chairs for up to 16 guests. The sitting room has comfortable sofa and chairs, TV, video/dvd and iPod dock. Large groups will love the additional space offered in the games room, which has relaxed seating and dining areas. Outside access to laundry with washing machine, sink, and drying space. We stayed at Les Chataigniers for ten days in September. We had nine family members and two small children, followed by four friends as some of our children left. Firstly the house, garden, games and pool were absolutely brilliant. The pool was securely padlocked with a fence surrounding it for complete peace of mind. The games room is so huge, brilliant for all ages !! Baby equipment and toys provided and very popular Wendy house in the garden. The house itself is so comfortable, roomy and great to have lots of en suites ! Large kitchen makes it easy to cater for a large group, especially with the gas barbecue just outside on the veranda. The chefs were happy ! The surrounding countryside is absolutely beautiful, with marvellous views and total peace. We all agreed it was the perfect place to relax. Great supply of maps for local walks and runs which we used a lot. So many beautiful towns to visit nearby. Albi is definitely a must see !! An absolute jewel. Christine was so helpful, going to the lengths of finding a local mushroom expert to identify our pickings and also supplying (as an emergency), two bottles of fizz to make cocktails on a Monday evening when the local shop was shut. Wonderful all round, what a find. We hope to return. It was a pleasure to host you, your family and friends - and we look forward to seeing you again in September 2019! Un accueil chaleureux dans cette maison formidable! Les chambres (chacune avec sa salle de bain), la salle de jeux, la piscine, le cadre .. tout s'est parfaitement passé pendant notre séjour. Merci Mark et Christine, et on espère de vous revoir l'année prochaine! Please note this is a comment by this guest, from our guest book in the house. Et merci à vous autres, Thierry! C'était un plaisir de vous rencontrer. We stayed at Les Chataigiers for a long week in August. It was even more beautiful and special than we could have hoped. The buildings are spacious and beautiful, it feels like a little corner of paradise as you're not too far from restaurants and shops but far enough to feel like you've got your own French country house in peace and quiet. Everything is done to the highest of standards, lovely en-suite bedrooms, so much space beautiful grounds. Theres a wonderful pool in a sun trap to while away a lazy afternoon after sampling the local produce. Simply beautiful- one of the most special places we've ever been to. Fantastic time at Les Chataigniers! The property is absolutely beautiful: situated on a ridge with amazing views, on the edge of a very pretty quiet village. The courtyard is instantly welcoming, gardens (including extensive vegetable garden and orchards) beautifully kept, and accommodation both chic and comfortable (and spotless). The pool is lovely and warm and a great place to laze and read a book! Chris and Mark were incredibly welcoming and very helpful with ideas of what to do in the area (and there is plenty to do, if you can drag yourselves away from the lovely property!). Our family had a wonderful, restful and fun break with something for everybody to do. 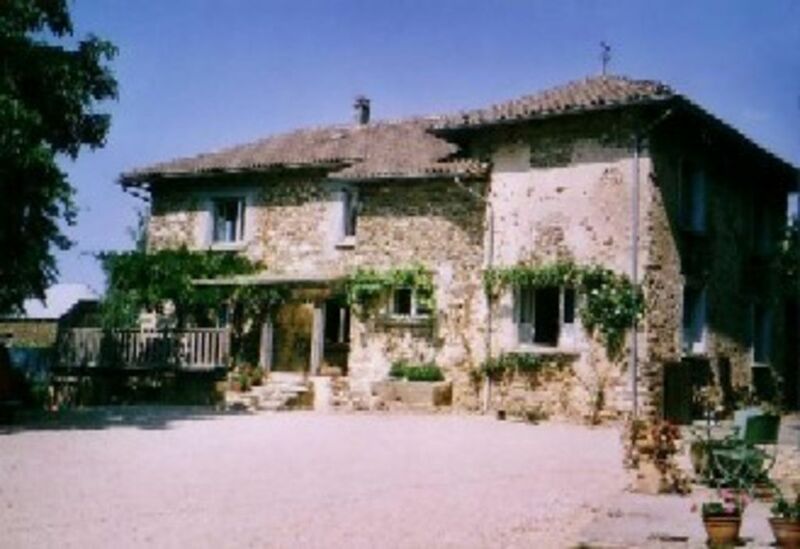 I would heartily recommend Les Chataigniers to anyone looking for a beautiful, tranquil haven! We are so pleased to hear how much you enjoyed your stay - thank you for this lovely review. We very much hope to welcome you and your family back here in the future. Our large family group have just returned from a wonderful week at Les Chataigniers. The property was modern, clean and well equipped. The facilities and grounds were enjoyed by all the kids (young and old) and Mark and Chris were friendly and helpful. Basically, everything was first class and this is one of the very best places we have ever had the pleasure to stay. Thank you. The Wise gang. If we could give 5 star reviews to guests, we would be giving one here! It was lovely to welcome a group who made the most of everything Les Chataigniers has to offer, and who treated it with such respect too. We very much hope to see the Wise Gang again in the future! Home to 10 of France's 'Most Beautiful Villages' - as well as the world's highest bridge at Millau - Aveyron is rich in culture, history and natural beauty, yet remains relatively undiscovered. This is the place for people who love the outdoors! Walking, riding, photography, cycling, fishing, kayaking - all can be enjoyed amidst stunning surroundings, clean waterways and pure air. Those with an interest in history will delight in exploring its bastide towns, its castles, its churches and cathedrals. For gourmets, there are several Michelin-starred restaurants close by - or shop for the freshest of ingredients in a vibrant marketplace then bring them home to cook at leisure. If you can drag them away from the pool, children will find much to entertain them in the area too - Cap Decouverte is a theme park with a difference; Micropolis, the city of insects, is fun AND educational. During the summer, street theatre and festivals are common, and of course every village has its own fete! TEN-DAY LETS MAY ALSO BE AVAILABLE DURING HIGH SEASON - PLEASE ENQUIRE LINEN - All bedroom linen, bathroom towels, pool towels and kitchen towels provided. Changeover at mid-point for two week rentals. HOUSEHOLD BASICS - On arrival, guests will find starter supplies of soap, toilet rolls, washing-up liquid and sponges plus household cleaning materials.